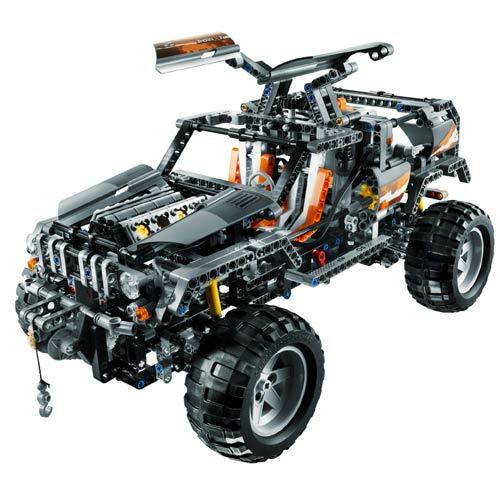 Today at TBs , another review for a 2H2008 TECHNIC set. This time the 8297 Off Roader. It is something I was to do since almost 3 months... Set was built, photos and videos taken, but simply had no time and enough quietude, to write it down as I'd like to do. Here some images from this set box. It is a large sized box and as usually, quite larger than required for its contents. While it looks nice on the shelves for the general consumer, it is a problem for the collectors who prefer to keep their boxes stored. On the backside you may find mainly images from the respective B-model, which is a Buggy. The box design has two seals in the front and a side perforated top that flips up. The top flips up in two levels, where the first just unveils extra images about this model and the several functions it features (either manually or via PF elements). A considerable amount of bags (21 and not numbered), plus 4 tires and wheels. Box also includes the manuals and one relative big sticker sheet. The building instructions are divided in three books for the main model and they are nearly A4 sized. They have respectively 76, 76 and 16 pages each and include 102 major building steps for the main model. I've found noticed just a small mistake, on step #75. B-model didn't get any instructions included in the box, but they are now available online for download. You won't find them at the TECHNIC instructions webpage from LEGO Costumer Service, but on the B-model instructions download webpage from the TECHNIC section. The B-model instructions being just available on-line, is in accordance to the actual tendency, presumably to save both costs and the environment. Despite several comments to this policy, a positive measure I would say. In the end of the third book you will find an inventory of included parts into this set (spares not accounted), which is now also a standard and could be of convenient use. Since this set has got no numbered bags, it is just a matter of opening all them and put parts together to start building (my preferred way even when getting numbered bags). However I admit, for a set of this size it could be easier for many, if parts have been organized in numbered bags. The building process would speed-up and parts used in each step would become much easier to find. For a set this large (with above 1.000 parts), the higher than usual price per part is justified by the presence of a few PF elements, although just one single motor. For a deeper review about all these new parts appearing at 8297, take some time to read this previous review, here at TBs . Together with the Linear Actuators, respective brackets and other 1H2008 new parts, we can say, this was a great year for TECHNIC fans, in terms of parts addition! I wouldn't say this set worths for the new parts included, also because it is too expensive if just to get such parts. Nevertheless it is actually the unique set available, to get some of them. Namely the new differential and new suspension arms. All the other are present at the PF Motor Set (8293) and some in other sets too. With this set, color coding for parts like: gears, pins and axles continues as a trend of the actual TECHNIC line. It makes the building experience easier, mainly for the part searching process. On the other end turns the sets more colorful, which may not be so nice looking for everybody's taste. When images from this set were first seen, everybody remembered the old 8466 (4x4 Off-Roder). This is quite different! New functional and working headlights. An innovative raising suspension mechanism. 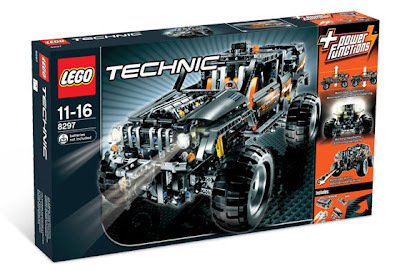 IMHO despite not an exceptional set or a flagship that will be part of TECHNIC favorites for the years to come, it is still a very good set and very well designed. The set building starts with the front axis, steering and motorized winch at the Off-Roader front. It includes the new suspension arms, one PF M-Motor and one 24 tooth clutch gear, which hasn't been so common lately despite appearing at 4 sets in 2008 (the absolute record, ever). Then it proceeds to the rear axis with its new differential and tight construction. There you will see several knob wheels, to raise/lower the suspension and to actuate steering via HOG, where high torque is required. As usual the techniques applied lead to a very good design and strong structures. It is also a solid and dense model, which is something, that I think to have improved specially in models for the last years . As we advance in the building steps, both front and rear parts get together onto a chassis where a kind of gearbox is built in the center and which allows us to select between lowering/raising suspension or motorized front winch functions. A few steps further, it is time to assemble the seats over the chassis (with their orange PF look&feel). Below some images which show in detail, the front winch and place where the Battery Box and Pole Reverser get installed, helping to understand how the model is operated. After selecting the function on the bottom lever, the pole-reverser is used to select in which direction the winch or the suspension, operates. Headlights, lit as soon as the battery box is turned on. Now lets see a few more images from this set, once assembling gets finished. Very nice looking this Off-Roader, with interesting and never seen functions. This is a relative large sized model with near 1.100 parts. 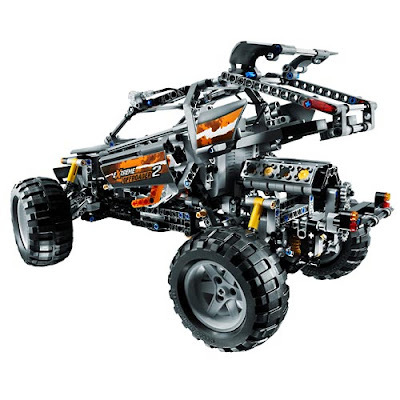 The largest TECHNIC set for 2008 and the richest in terms of Power Functions elements. Functional wing doors at the sides. Manually open bonnet and trunk. Still not the supercar, many of us have been waiting for, but a car with a rich and interesting set of functions anyway. The working headlights and the correspondent PF lights, are definitely a great addition to the range of PF elements. They exhibit a white light, achieved with white LEDs of high brightness. The seats have a very nice looking orange touch, which gives them a very PF style. Despite none precise or sophisticated control, they can be pushed frontwards to easily access the backside. However the most sophisticated feature of this Off-Roader, is the motorized raising/lowering suspension mechanism, combined with usual suspension shock absorbers. Observe it in detail, from the images below. Finally take a look into the video below, that I've prepared to show several of the Off-Roader functions in action. With special emphasis to the suspension. It was a good time, the aprox. 4 hours spent, building this model. 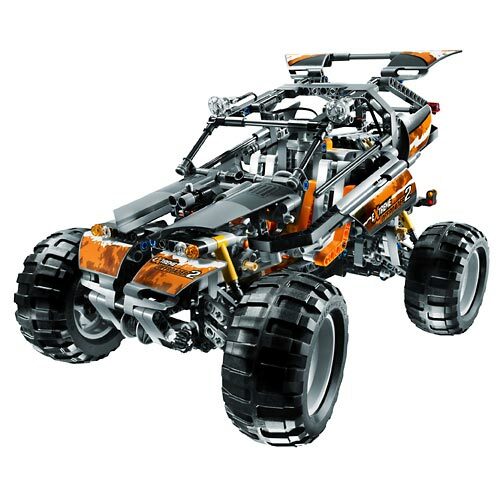 The 2nd model suggested by the designers for this set, is a Buggy which I find to be a nice looking model, with almost as many interest as the main model. It makes use of the same Power Functions elements, but there is no driving ring for function selection. So the M-Motor controls one single function, which is used to raise and lower the backside of the buggy's body. It should be the target for a next review here at TBs . In the last section of this review, I'd like to raise your attention for this model registration plate below. Differently from older sets which use to display the set reference number, sometimes with a few additional letters, this one displays "L4R5 K7". It is a Leetspeak form, for the name of this set designer. Lars Krogh Jensen or Lasse. Is their enough space to be easily modded for drive motors? Or does the interior have to be altered significantly to include them? Thanks so much for this review, mine is in the mail. I can't wait to get it. Loved all the detailed pics and good comments. Had this model since august and really love it, but i'm stil waiting for a new supercar( with PF) to emerge from Lego Company! Good info en nice topics! I just got 8297 for my birthday on monday, and spent the last 2 evenings building it! very good build, and a nice solid vehicle. One little thing: the sticker that goes onto the Power Pack, has 2 icons, which I assumed to be 'normal' and 'high beam' for the headlights, however, I can't notice any difference in brightness in the lights. This is with fresh AA batteries too. I'm surprised they didn't make the lights toggle between 'ON' and 'Blinking'... a bit like the old Light and Sound system lights, which added to the usefulness of them. The only downside to the kit, is that the Battery Pack is bolted in, and a bit tricky to remove, if you need to swap the Batteries. Unlike, say, the 8275 Bulldozer, where the Battery Pack slides in and out easily. Although I guess with only 1 motor, you're not likely to flatten the batteries very quickly - compared with 4 in the Bulldozer!